The Personalised Handstamped Star and Birthstone Necklace is a beautiful modern silver or rose gold pendant necklace with a birthstone of your choice. 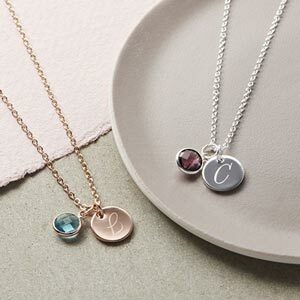 The Personalised Handstamped Star and Birthstone Necklace features a silver or rose gold plated trace chain with a stylish star pendant.and birthstone of your choice. The star can be personalised with a letter of your choice. Each necklace is hand hammered to order in the studio, making a truly unique item. This beautiful necklace is available in silver or rose gold and includes an handstamp initial. 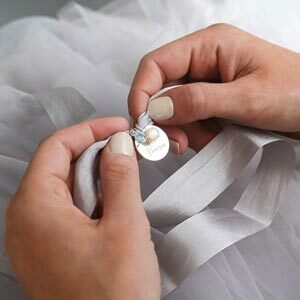 A handstamped letter can be added to your necklace to make it truely unique. We have a variety of luxury packaging with beautiful foil cards. Beautiful necklaces. Personalised with initials and birthstones making them a great gift. I am thrilled with this product and can't wait to gift it to someone special, at Christmas time. Beautifully manufactured and packaged.